Possibilities of conducting joint degree courses and research as well as exchange of teachers and students between Jamia Millia Islamia (JMI) and universities of Netherlands were explored yesterday between the two sides. 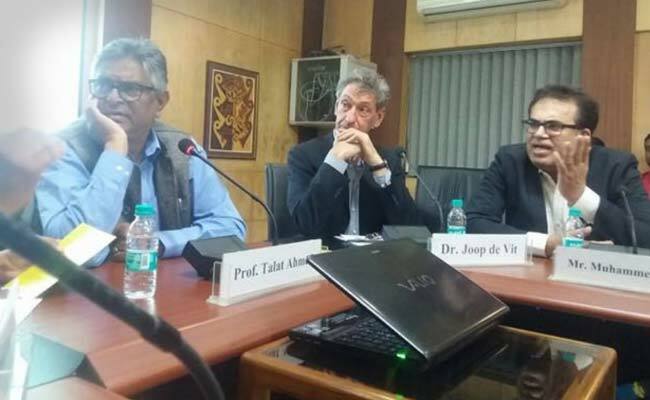 JMI Vice Chancellor, Prof Talat Ahmad discussed the avenues of collaborations with senior officials of Netherlands Embassy in New Delhi and heads of educational institutions in that country during a presentation on ‘Study, Research & Fellowship Opportunities in Netherlands’ organized by Indo-Arab Cultural Centre, Jamia Millia Islamia. Speaking on the occasion, Prof Ahmad said that normally students from India go for higher studies in universities in England, America and Australia. Very few go to Netherlands where there were vast opportunities for higher education. Netherland officials assured the Vice Chancellor that they would favourably look into the possibility of conducting joint-courses and research works between the universities of their country and Jamia Millia Islamia. Prof Ahmad also suggested of signing of memorandum of understanding (MoUs) with various Netherland universities and JMI to conduct joint research works which can funded by both sides. Dr. Joop de Vit of the Hague-based International Institute of Social Studies of Erasmus University explained in details about the courses and the scholarships available in the university. Prof Mehtab Alam, Dean, Faculty of Engineering & Technology, Prof Sushant G. Ghosh, Hony. Director, Multidisciplinary Centre for Advance Research and Studies (MCARC) and other senior faculty members and students of JMI were present during the presentation happened in the university.